Attorney General William Barr attends a First Step Act celebration in the East Room of the White House April 1, 2019 in Washington, DC. Well, what do you know? The Trump-guy that Trump handpicked to run the Department of Justice—America’s top cop if you will—the guy that Trump picked to supersede Jeff “King Keebler” Sessions after he recused himself from all things Russia-related, didn’t quite convey the true essence of special counsel Robert Mueller’s investigation into Russia collusion in the 2016 presidential election. 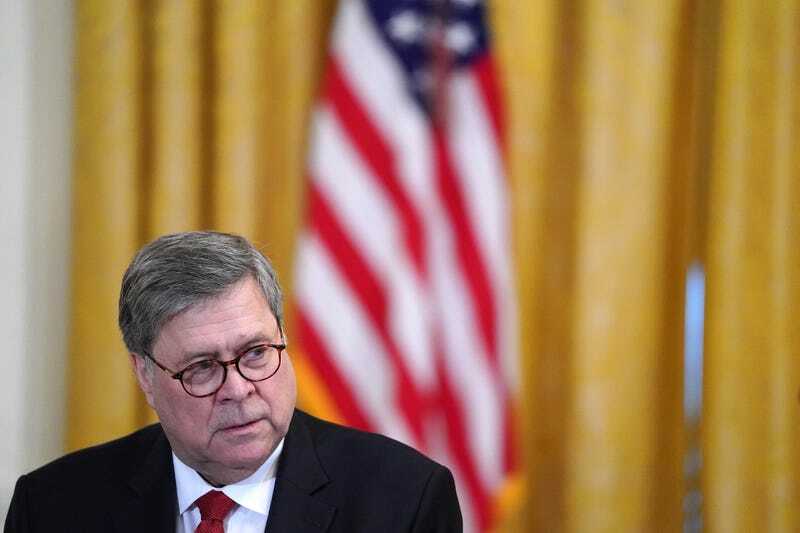 Turns out that the patriarch of the Flintstones clan, Attorney General William Barr, may not have conveyed how damaging Mueller’s 400-page report really was to President Donald Trump. According to the The New York Times, several investigators who worked alongside the special counsel believe that Barr did not adequately portray the findings of the nearly two-year investigation when he presented his four-page summation of 400 pages that basically noted that President Trump has the eyes of an eagle and the biceps of a Russian tank. Investigators are worried that Barr’s four-page love letter to Trump has tainted the public’s view of the report. Mueller’s team was made up of 19 lawyers, about 40 FBI agents and other personnel, and those interviewed did not comment on the parts of the report that they believe are more damaging to Trump. In March, Barr submitted a summary of the findings of Mueller’s report to Congress. Barr noted that Mueller didn’t establish a connection between Trump’s campaign and Russia. While he didn’t fully exonerate Trump, he didn’t condemn him either, or at least that’s how Barr reported it. Barr claimed that there wasn’t enough evidence to establish obstruction of justice. It was Barr’s interpretation of the 400 pages that has Trump riding an Adderall high and claiming that he’s been fully exonerated. Barr has claimed that Mueller’s report would be released to Congress and the public “mid-April, if not sooner” and has also offered to testify after the report is released, CNN reports.